The patron saint of Creed is first recorded as St Crite in the 10th century and may well have been a Cornish saint. Generally thought to be female, later tradition claims her as the daughter of either King Mark of Cornwall or an Irish king. There are traces of a circular churchyard and a 12th century pillar piscina from the Norman church survives. Transepts were added to the Norman nave and choir during the 13th to 14th centuries. Then in the 15th the south aisle replaced the south transept and a tower was built. Medieval glass in the windows was probably smashed by Parliamentarian soldiers leaving only minor remnants in the tops of the windows. The tower was struck by lightning in 1781 and three of the four pinnacles from the tower were thrown off and fell through the ceiling of the church. Repairs were carried out, but by the early 19th century the church was in a sad state of disrepair. A complete restoration was carried out and completed by 1904 at a cost of £1,000; the restored church was described as a ‘phoenix rising after years of neglect’; unfortunately, the box pews were lost at this time. In 2006, the roof valley was re-leaded at a cost of almost £100,000; a contributory grant of £4,000 for this was received from the CHCT. * In times gone by, members of the congregation would have travelled to church by boat along the River Fal. * Adam de Bron, who was Rector in 1314, was also the founder of Oriel College, Oxford. 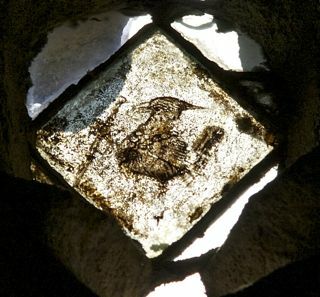 * In the 3rd window of the South aisle is a bird wearing a chain of office and carrying a baton; this is one of the examples of the small amount of remaining medieval glass in the church. Also in the East window of the Lady Chapel are the remains of the sleeping soldier, which was part of a Resurrection scene. * The Rector’s prayer desk was made from part of the medieval rood screen and contains some interesting carving. * William Gregor, Rector of Creed from 1793, discovered the ore from which produced titanium is produced. * Over the entrance door, painted on board, is the letter from Charles I thanking Cornwall for its support at the time of the Civil War. * The north door (behind the curtain on the north wall) contains the ‘Devils window’ to let out the devil at baptisms. * Also on the north side is a memorial plaque to John Hampden, MP for Grampound, a rotten borough, who died in battle at the end of the Civil War. * To the south of the east end of the church is a two storey building which contained stalls for eight horses and a ‘school room’. This has now been converted to give provision for disabled people. The CHCT is grateful to Michael Swift, Ecclesiastical Glass Historian, for his contribution to this history.